Who's building 1/32 and where do you keep them?????? The other day I stopped at a fairly large hobby shop and was floored by how many 1/32 kits there are now, also the immense ship kits out too (the new 1/72 Gato is something like 4 feet long). Even though I mostly build 1/72, I think its great to see these new kits but I'm curious about the people building them. Do you only do 1 or 2 of your favorites? If you build many do you have a barn to store them in? When I was younger I mostly built 1/48 but when I started building again a few years ago I went with 1/72 primarily for the space issue. I have no idea where I'd put a bunch of 1/32 aircraft although I'm tempted to try one, just afraid it would lead to more. I build ! :32 World War II Aircraft and hang em from 20lb test line in my office at work. I have 8 up there right now and have 6 more to complete. My office is about 13 x 13. My avatar shows one of them hanging. I find that 1:32 is big enough to easily detail and yet the detail can be appreciated from a distance , too. The guy who makes my custom decals builds 1/32 and 1/24....he actually had an extra room included to his new house design when it was built a year ago...and it's full of 7 foot tall glass, lighted display cases - an entire room full of them! Cheers, LeeTree Remember, Safety Fast!!! 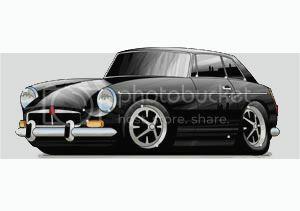 I build 1/32 scale mainly because anything smaller gives me eye strain. I keep some on shelves but I also have an old department store glass display cabinet that is 5 ft. long, 4 ft. high, and 36 inches deep with 3 glass shelves. Its not exclusive to models, though. It also holds NASCAR memorabilia. This case was given to me because the store was remodeling and were putting in new displays. DONT be afraid to ask at your neighborhood retailers. You may not get it free like me, but at a good price, anyway. It seems to be our American mentality that bigger is better. I think if all of us modelers were well funded and had the space you would see even more huge kits. 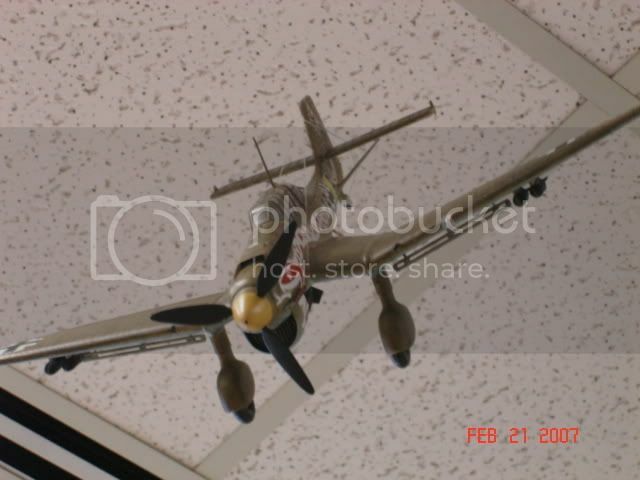 I myself could not resist building a 1/24 Airfix Stuka even though I knew when it was done I would have no place to put it. It is pearched precariously on top of my speaker cabinet right now collecting dust as we speak. But it looks so cool because it is so darn big! I am sure I will knock it off sometime in the not to near future. That is why I took plenty of pictures. Anyway that is just one mans opinion and we all know the how the saying goes about opinoins! Hanging them from the cieling is the best place that I know of. I have a couple of kits that I built some time ago hanging (literally) around still. I build mostly 1/72 but I like the big heavy WWII bombers and transports and they are just as big or bigger than the 1/32 fighters. I've also seen or heard of people that hang aircraft from the underside of the shelf which doubles your shelf space. I only have 3 1/32 scale kits, two in progress (on hold at the moment) and one still in the box. For me, building in that scale is the exception and not the norm, as I restrict myself primarily to 1/48 and 1/72 due to space limitations. When the time comes to display them, they will sit on a base or shelf behind glass to keep them protected from dust. Yes, everything seems to be getting bigger & bigger; I was in my LHS a couple of weeks ago and, yeah, there were a ton of 1/32nd aircraft kits, not to mention a lot of big ship kits (like that new Revell Gato-class sub). Some of the kits were so big they took up space on the other side of the shelf! A lot of the newer 1/32nd kits seem to be Trumpeter kits, they must be trying to corner the market on bigger model kits (including armor). these will join the F4U, Zero, Spit Mark VB, P-40E, Fw-190, Hurricane Mk II, Me 109g, and Ju-87B currently hanging in my cluttered office airspace. Well thanks for the replies, I was just curious where all these huge kits were going. claudez, does OSHA require you to post a Hard Hat Area sign on your door. I have to say that would really spice up the office, sort of like working in a dogfight. I use to build only 1/48th planes and the occasional 1/32nd ME-109's but in the last couple of years my stash collection of 1/32nd aircraft is steadily growing, now I'm waiting for the arrival of the Trumpeter A-6 and AV-8B. There's some outstanding 1/32nd scale models out there. When ever I do start building them all, room will be a problem but I will cross that hurdle when it comes around. I tried hanging a few from the ceiling, but they obstructed my view of my Farrah poster collection, and I wasn't too good at it, anyway. They always ended up hanging sideways, one wing straight up and the other straight down. And at least once a plane hanging from the ceiling fell onto the top shelf and took out a couple more planes. But I'd do it all again in a heartbeat. If I could afford those same kits now, that is. I have been picking up 1:32 scale kits on ebay for next to nothing.. I now have 14 different machines, 6 left to build.. All World War II, hanging in my office. My degree is is in History and World War II is my area of expertise.. Now if I can only get the rest of my stash built.. I build mostly in 1/48, the detail is good and they don't take up that much space(although thats not what my girlfriend says). I too have recently picked up a few 1/32s on ebay though. A P-47 Razorback from Revell/Mono and a P-40, two of my favorite planes. When I got my latest issue of FSM my mouth really started to water when I saw the ad from Hasegawa for their new 1/32 P-47 bubbletop! this kit has jumped to the top of my list!! Just hope a new Razorback is also in the works. I have a few of my favorites, but displaying them is going to be a chore until I get my own hobby room! The Hornet and Tomcat are HUGE! 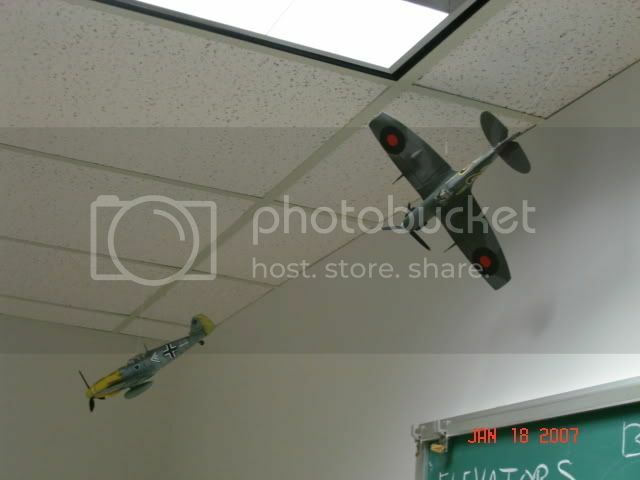 I hang up all my aircraft models using cup hooks in the ceiling and fish line. For heavy planes, I use a couple of cup hooks. I saw some pictures here or on another forum of someone who hangs all his aircraft by the tail from the wall. The whole wall is a kinf of 3D mural of aircraft. I'm waiting for the Hase kit too, the word is it will be released next month sometime. i build 48 but im going into the 32´s and i personally would like to see some multi engine world war 2 birds like, let´s say the mitchell or the havoc or even a liberator or a b-17... would be cool aint it? A general rule of thumb is that the bigger the kit, the slower the seller in the hobby shop. Monogram listened to the clamor and released a 1/48 PBY, but it didn't sell well. People liked the idea of a 1/48 PBY, but most people don't have the room to display one when built. 1/32 is already a smaller market than 1/48. Larger kits are going to have some sales resistance. A 1/32 B-25 might sell OK. People would drool over a 1/32 B-17, but few would shell out the $150+ to buy one. I like big kits. I have most of the 1/24 scale kits made as well as a large percentage of WW II 1/32 kits made. I would think twice about a 1/32 B-17. My SO is extremely tollerant of my hobbies, but she might reach the end of her rope if I started buying 1/32 B-17s. Talked to the guy at my LHS about the 1/32 P-47 from Hasegawa t-day and he said it would be released at the end of April and be in country, by May 10, with a MSRP of $64.00USD. Just a head's up for those interested . are we experiencing a new golden era of model building? Not only Hasegawa, but Trumpeter is also planning to release 1/32 Thunderbolts! Trumps' new F9F Panther is also a gem. I heard they got a Cougar in the pipeline too. I've read/heard that somebody may bring out a new P-80 Shooting Star in 1/48. And I would love to pin a Modeller's Gold Medal on Hasegawa's collective chest for there 1/48 JEEP! licencing be D*MNED !!!!!!!!!!!!!!!!!!! I would not be surprised if somebody(Trumpeter?) in the near future brings out a new B-17 in 1/48. I love Monogram's big bird, but its time for a new-tooled fortress. My fantasy also plays with the idea of a 1/32 fortress, BUT I think that would be the line in the sand for my girlfriend and the limited space in our flat. Because of Boeing's agressive lawyers, most model companies aren't going to touch a new B-17. The cost of a newly tooled mold in the level of detail people expect today would be very expensive. The old Monogram kit sells for $20, but a new kit would probably sell for around $150. A year or so back, I wrote Revell-Monogram and suggested they retool their old classic US bombers. Since those kits are grand fathered in, Boeing isn't demanding royalties for them. Additionally, Revell has a head start over other kit makers because they already have the molds. All they need to do is dress up the existing kits. I mentioned it here and some other people write them with similar suggestions. One person came back and said he got a reply from Revell that they were considering it. I suggest to people that they keep writing Revell and asking for a retooled version of the old Monogram bombers. As far as storage/display, I'm lucky to have 1/4 of a cellar with a large self built floor to ceiling case, however I have planes and ships everywhere hanging ...placed on shelves....on tables. I would like to devise a permanent solution ........I have a lot of ships, and all my armor is put away, in a case under the stairs out of site.